Power Supply Units - PSUs - PC Buyer Beware! The image at the top of this page shows two ATX PC power supply units (PSUs). On the left is a standard PSU that comes with all of its connector cables attached to it – bundled on the far left side of it – and on the right a modular PSU to which the connector cables are attached as needed. A modular PSU is best because of the minimal use of cables that allows better air circulation within the case. Version 2.31 dating from mid-2008 is the latest ATX PSU standard. PSU standards are not updated much since they are tied into the standard used by motherboards and cases, which has mostly been the ATX standard for decades. Semi-modular PSUs have their 24-pin ATX power cable that connects to the motherboard permanently connected to the unit, but all of the others – SATA, Molex, PCI Express (PCI-e) auxiliary power connectors for one or more graphics cards – can be removed individually if not required. For information on installing a power supply unit and connecting it to the other components, such as the motherboard and graphics card(s), visit Detailed PC power supplies/PSUs information section of the Build Your Own Desktop PC article of this website. Installing a power supply unit in a case is merely a matter of finding out where the bay is for an ATX power supply and then screwing it into that bay so its fan is showing at the back of the case. Power supplies come with all of their connectors built into the PSU or have connectors that can be added when needed, a type of PSU called a modular power supply. A computer’s components either draw their power from the motherboard, which is itself entirely powered by the power supply, or directly from the power supply via cables (e.g., the drives) that support those components – or both. A graphics card, for example, can be powered from a motherboard slot and from one or two PCI Express auxiliary power connectors from the power supply. Installing the major components of a PC are dealt with individually in the Build Your Own PC section of this website. PC cases can be purchased with a power supply unit or without one. The ATX PC Cases and Case Fans section of this website deals with cases and case fans. Note well that it is common for the PSU that comes with a brand-name PC or that comes with a case to be of poor quality. To find out if a poor-quality PSU should be replaced, which is highly advisable, open the case, make a note of the make/model of PSU and use those details to conduct a web-search. NEVER OPEN A POWER SUPPLY UNIT. ITS CAPACITORS CAN CARRY A LETHAL CHARGE LONG AFTER IT HAS BEEN SWITCHED OFF! NOTE WELL – BEFORE TURNING A POWER SUPPLY ON, IF THERE IS ONE, ENSURE THAT THE VOLTAGE SELECTION SWITCH ON THE PSU IS SET CORRECTLY (230V in the UK -110V in the USA). Most power supplies switch to the correct voltage automatically, but you should make sure that any switch is set to the correct voltage used by your country’s mains electricity supply. The following webpage covers the mains electricity voltages used in various countries. The following Wikipedia page provides detailed technical information. Remember that PSUs contain capacitors that retain their charge long after being disconnected from the mains supply, so never work on PSUs unless you know what you’re doing. There are plenty of videos on YouTube and articles on the web on repairing PSUs, some better or much better than others. Failure to ensure that the voltage switch on a PSU (if there is one – some PSUs are pre-set with the setting for a particular country) is set to the correct voltage can destroy it or at the very least blow a fuse in it. The UK mains supply voltage is about 230 volts AC. It used to be 240V, but it has been reduced in order to bring it slowly into line with the rest of Europe, which is 220V. Current PSUs can provide all kinds of protection – short-circuit, overload, over-voltage, under-voltage over-current and over-temperature protections. The more protection that is provided the more expensive the PSU up to a certain point. The more protection the better, so I would not spend any less than between £30 and £40 for a PSU and I would always choose a reputable manufacturer such as Corsair. ATX PSUs costing less than £20 should be avoided. The job of the power supply unit (PSU), usually just called the power supply, is to deliver a stable voltage to the PC’s components via its motherboard. If it does not do that, the PC will crash (stop working) and the components can be fatally damaged. If it fails to work, none of the PC components can be powered up. The amount of power a PSU can deliver is measured in Watts (W), therefore the make/model always contains its maximum power output in W – 500W, 600W, 700W, etc., in its model’s name. The PSU has to be able to power all of the computer’s components with some overhead available in case all of them are used at once, which is not something that will happen very often. Here is a power-supply calculator in which you add the components your PC has. When you click its Calculate button, it calculates the Recommended Minimum PSU Wattage. I would then buy a PSU that is rated about 100W higher than that figure. I just did a calculation of the estimated wattage used by a workstation of mine that uses an AMD Athlon X2 3800+ dual-core processor, an MSI MS 7093 motherboard, a Nvidia GeForce GT 710 graphics card (PCI-Express x8) with passive cooling, four hard drives, a DVD writer, keyboard and mouse. That system requires an estimated 275V. It uses a quality 350W PSU made by Corsair, which leaves 75W of overhead. That is fine if the PSU is a quality unit. However, a cheap 400W or even 500W unit would probably be inadequate. In short, always make sure that your desktop PC has a brand-name quality PSU, such as one made by Corsair or any other brand-name manufacturer of quality units. 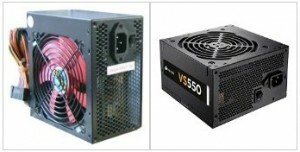 If, say, you buy a 1000W quality PSU and your system can only draw 650W – if all of its components are being used at once – you have 350W of overhead that won’t ever be used. The system will not draw 1000W just because it is available, only the amount of power it needs, so you can never buy a power supply that is too powerful. Quality PSUs have circuit protections built into them, the more expensive they are the more circuit protection they tend to provide, so units of quality should shut down if they are required to drawn more power than they are able to deliver, but in older, low-quality or power supplies that have been given a wattage rating that they can’t deliver, they tend just to go bang, giving off a loud report. Sometimes they can take all or some of the other components with them. Rarely they can cause a fire when they go bang, which is why it is essential that you should always make sure that any PC you buy, new or second-hand, has a PSU of good quality. Nvidia and AMD are the two major manufacturers of graphics cards. SLI/CF for the graphics card stands for Nvidia’s and AMD’s SLI and CrossFire technology respectively that makes running multiple pairs of graphics cards in tandem, so you only select it if your PC uses more than one graphics card that are set to use that technology. FB DIMM for the RAM memory is only selected if the computer is using fully-buffered memory. Most computers use normal or unbuffered memory.You can use the free CPU-Z tool to identify the RAM memory. Look under its SPD tab to find out what the part number is of every installed DIMM module. Looking up the part number on the web will tell you if it is unbuffered or buffered. About five years ago, I bought an Advent office PC that was powered by a cheap 400W power supply, so I switched it with a 400W Corsair power supply and it is still running now having only ever been switched off to service it. The power supplies used in standard desktop PCs comply with the ATX standard, ATX12V 2.x, where x represents a minor change in the standard, such as 2.1, 2.2, etc., and the maximum power output is measured in Watts. The average computer should have a 500W unit, with a 650W to 750W or higher unit for a power-hungry PC that uses one or more high-end graphics cards or many hard disk and CD/DVD drives. Note that a power supply with a maximum output of 650W won’t be drawing that much power all the time like a 100W light bulb does; it will only output as much power as the computer requires. 1. – Molex. Used to provide power to older IDE hard disk and CD/DVD drives and internal case fans. An adapter can be purchased to convert it into a 6-pin PCI Express (PCI-E) connector required for the auxiliary power required by some graphics cards. A Molex connector cannot be converted into an 8-pin PCI-E connector used by some graphics cards. 2. – PCI-E. Used to provide auxiliary power to graphics cards that use the PCI Express standard and can have 6 or 8 pins. As mentioned above, there is no adapter cable available to convert a standard Molex connector to the 8-pin type. Most 8-pin connectors have a detachable 2-pin section that converts it into a 6-pin connector. 3. – 24-pin ATX power connector. This is the main connector that connects the power supply to the motherboard. Some of them (not all) have a 20-pin section and a detachable 4-pin section. When the 4-pin section is detached the power connector can be connected to the older 20-pin connection point provided on older motherboards for the older ATX 1.3 power supplies. 4. – SATA. Used to provide power to the latest hard disk and CD/DVD/Blu-ray optical disc drives and SSD data-storage drives that can be used instead of standard hard disk drives. 5. – Secondary ATX connector. Motherboards have required to be powered a secondary power connector since about 2005. It was a 4-pin connector for a long time, but new motherboards now require an additional 8-pin connector. Some 8-pin auxiliary power connectors can be split into two 4-pin connectors so that they can be used with an older motherboard that supports the ATX 1.3 power standard, but as time goes on fewer PSUs will provide the split. The image below is from the user manual of an Asus Sabertooth X99 Intel Socket LGA2011 motherboard showing the location of the main 24-pin, 8-pin and 4-pin power connectors. If you visit the following webpage and hold the mouse pointer over the motherboard (second image from the left), the image is selected to appear as a large version in the main display area. Placing the mouse pointer over any area of the board presents a magnified version. The 8-pin auxiliary power connector, labelled ATX-12V-2×4, hardly visible, is in the top right-hand corner of the image below. Note that if you install a PSU without connecting this connector to the motherboard, the PC won’t boot. The auxiliary 8-pin PSU power connector on a Gigabyte motherboard. Click on the image to see its full size. The main 24-pin connector that connects the PSU to the motherboard is in the middle of the bottom section of the board under the four memory slots. Note that a modular power supply allows the user to add the power cables as required instead of having all of the available connectors, none of which can be removed, coming from the non-modular power supply. The power supply is connected to the mains electricity supply via a power cable and the power supply is connected to the PC’s motherboard via the power supply’s power connectors. 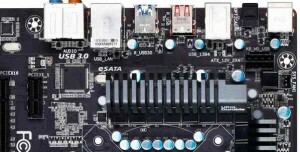 Most motherboards must be connected to a main power connector and an auxiliary power connector from the power supply. If the auxiliary power connector is not connected, the PC will not boot. The computer’s components are powered only via the motherboard (most adapter cards, such as network cards and sound cards) or only by the power supply, as is the case with hard disk and optical disc drives. Some high-end graphics cards are powered from the motherboard and require to be connected to up to two power connectors from the power supply; most low-end graphics cards just require to be installed in a slot on the motherboard. When the PC’s Power button is pressed a jumper is shorted and the motherboard switches the power supply on, which then provides power to the PC’s components. Therefore, if the power supply is not connected to the motherboard and its fan works when its own power switch is on and the mains supply is turned on, the power supply is faulty. 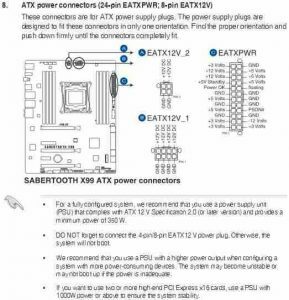 If the power supply doesn’t work when the Power button is pressed, the motherboard is not turning the power supply on. 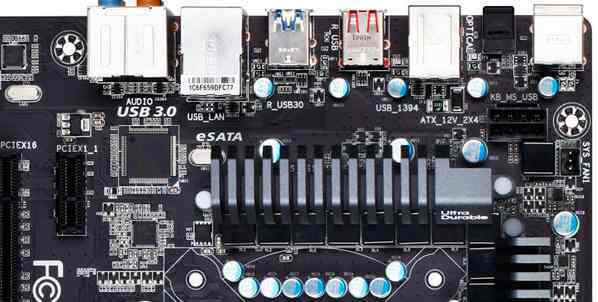 The motherboard itself is therefore probably faulty or its connections to the power supply are not properly connected. What happens when the Power button is pressed when the computer is working is set under Power Options in the Windows Control Panel. The available settings can make the computer go into hibernation, go into standby mode or switch off. The power supply unit is one of the most overlooked components in a PC. I suppose the reason is that most people simply believe that if a power supply unit has the physical capacity to be connected to as many other components via the motherboard then it must be able to deliver the quality of power that they require. Unfortunately, that is often not the case, because the power supply in a desktop computer, or the power supply that comes with a PC case, can be under-powered or of low quality. If that is the case and you install a high-end graphics card or a dual-core or quad-core processor, the system could become unstable, might even fail to boot, or the power supply could even blow up under the strain. Note that most power supplies are the same size and should fit into a standard ATX case, but some of them, such as the Zalman ZM500-HP, Hiper Type M 670W, and Tagan Dual-Engine 700W, have more depth than is usual, so make sure that you can fit a power supply in your PC case before you buy it by checking its dimensions. In the UK, a power supply uses the 230V AC mains supply and transforms it into power at the correct voltages for the computer’s components. The following webpage provides images of the connectors that a modern power supply unit provides.